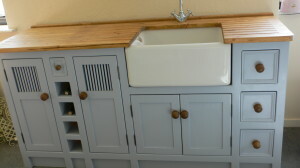 This georgeous sink unit has lots of quirky features including a big favourite…a line of wine bottle holders with a tiny drawer for corkscrews at the top, the doors either side have painted dowel inserts and the drawers have a beaded edge detail. The painted sink unit with wine bottle holders has been painted in an eggshell finish ‘Parma Grey’ (but you may choose your favourite colour.) The 27mm pine worktop and matching knobs are stained in our antique pine colour then handwaxed with waterproof wax making them durable.